I caught this rare subway mullet last week while riding the N train. You don’t see them around NYC very often these days. You might remember that mullets had a short-lived, pop-culture Renaissance back in the early 2000s. Sadly, they’ve since faded back into the darkest corners of Walmart and NASCAR events, which is why it’s such a treat to see one out in the open like this. 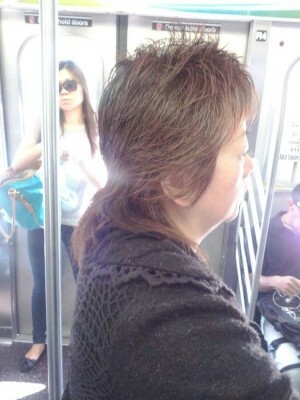 Anyway, I was thoroughly impressed with this lady’s well-manicured plumage (official classification North American Domesticated Asian Mullet). Notice the light feathering about the temples and gentle spiking atop the plume. You can tell she really takes care of it.